This is the latest of a series of articles that I am writing this month in celebration of the brave men and proud ships of the United States Navy on its 236th Anniversary. Thursday October 13th is that day and I ask my readers to wish any United States Navy Sailor that you know a “Happy Birthday” and thank them for their service in this time of war. 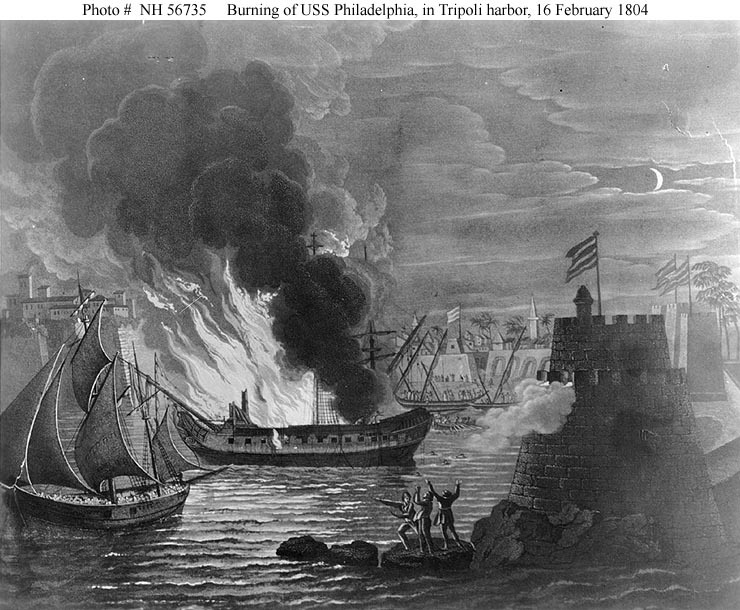 In 1803 the United States Navy was two years into its campaign against the Barbary Pirates who sailed from Algiers, Tunis, Tripoli and Morocco. For years the United States like other nations had paid tribute to the rulers of these states for free passage of its ships and hefty ransoms to free the sailors that were enslaved following the capture of their ships. By 1800 tens of millions of dollars had been paid and in that year the amount of tribute paid was 20% of the government’s total revenue. In 1801 the Pasha of Tripoli Yusuf Karamanli demanded the payment of $225,000 tribute from the new President of the United States President Thomas Jefferson. In years past Jefferson had advised against payment of tribute believing that such payment only encouraged the Barbary States to continue their actions. The anti-naval partisans and even his Republican allies had blocked his recommendations even though Secretary of State John Jay and President John Adams agreed with him. These partisans insisted that tribute be paid irregardless of the effect on European trade or the fate of American seamen because they believed that the Atlantic trade and involvement in the “Old World” detracted from the westward expansion by diverting money and energy away from the west. 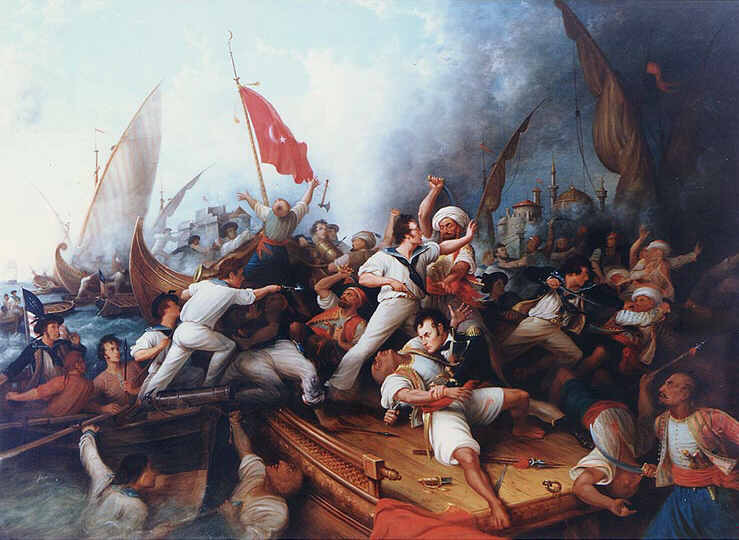 When Jefferson refused the demand and put his beliefs into practice Karmanli declared war on the United States by cutting down the flag at the US Consulate in Tripoli. Jefferson sent the best of the United States Navy to deal with the situation and US Navy ships soon began to take a toll on the pirate vessels. The squadron was composed of ships that would become legend in the history of the Navy. Commanded by Commodore Edward Preble and included the USS Argus, Chesapeake, Constellation, Constitution, Enterprise, Intrepid, Philadelphia and Syren. Numerous young officers who would distinguish themselves in the following years served aboard the ships of the squadron. One of the young officers was the 24 year old Captain of the 12 Gun Schooner USS Enterprise Stephen Decatur the son of a Navy Captain who had entered the Naval service as a Midshipman in 1798 and who had risen rapidly through the ranks due to his abilities and leadership. He was among the few officers selected to remain in service following the end of the Quasi-War with France. By the time that he took command of Enterprise Decatur had already served as the First Lieutenant of the Frigates USS Essex and USS New York. After an altercation with British officer while wintering in Malta he was sent home to command the new Brig of War USS Argus. He was ordered to bring her to Europe where he handed over command to Lieutenant Isaac Hull who would achieve fame in the War of 1812 as Commanding Officer of the USS Constitution. Decatur was given command of Enterprise on when he detached from the Argus. On December 23rd 1803 while operating with the Constitution Decatur and the Enterprise captured the small Tripolian ketch Mastico which was sailing under Turkish colors. The small ship was taken to Syracuse where Commodore Edward Preble condemned her as a prize of war, renamed her Intrepid and placed Decatur in command. Normally such an event would be considered a demotion for an officer of Decatur’s caliber but events at Tripoli had forced Preble to make a bold strike at the heart of the enemy. On October 31st 1803 the Frigate USS Philadelphia one of the most powerful ships in the squadron under the command of Captain William Bainbridge ran aground on an uncharted shoal and was captured. Her crew was taken prisoner and the ship floated off by the Tripolians partially repaired and moored as a battery in the harbor until her foremast could be remounted having be cut away by Bainbridge in his unsuccessful attempt to float the ship off the shoal. The threat posed by such a powerful ship in the hands of the enemy was too great to ignore. 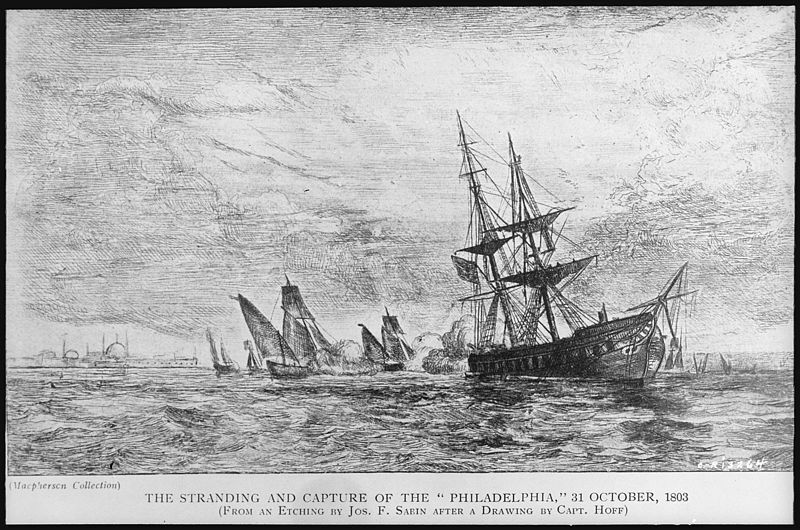 Preble order Decatur to man the Intrepid with volunteers to destroy the Philadelphia at anchor. Decatur took 80 men from the Enterprise and was joined by eight more volunteers from USS Syren including Lieutenant Thomas McDonough who had recently served aboard Philadelphia and knew the ship well. 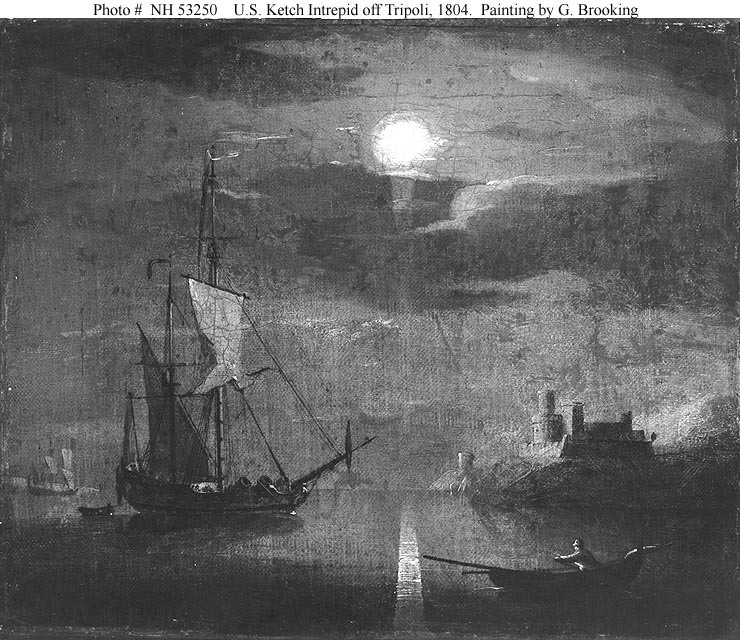 Under the cover of night of February 16th 1804 Decatur took the former Tripolian ship into the harbor beneath the dim light of the new moon. Posing as a Tripolian ship he was able to slip past the guns of the forts overlooking the harbor using a Sicilian sailor who spoke Arabic to request permission. This was granted and Intrepid approached Philadelphia and when close enough ordered his crew to board the Frigate. 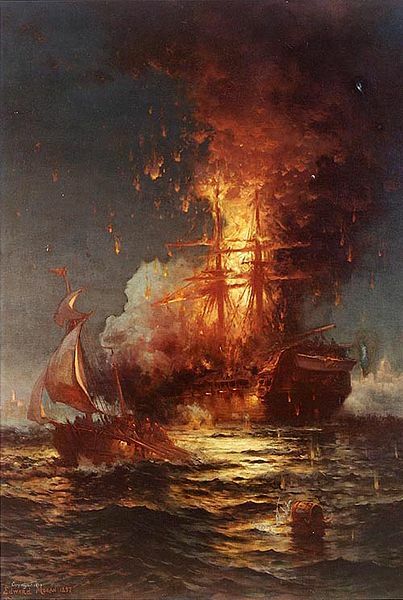 After a brief skirmish with the small contingent of sailors aboard he took control of the vessel and set it ablaze. When he was sure that the fire could not be extinguished he ordered his men back aboard Intrepid and sailed out of the harbor under the fire of the shore batteries and gunboats. 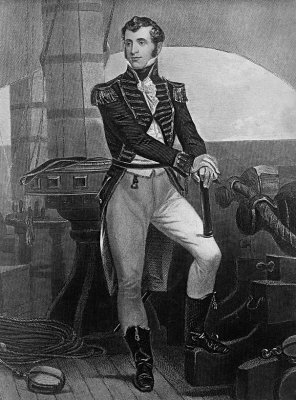 Decatur would return to command the Enterprise in 1804 and would prove himself again against the forces of Tripoli. He distinguished himself in the years to come against the Royal Navy in the War of 1812 and later in the Second Barbary War. Decatur’s squadron decisively defeated the Algerian fleet capturing the Frigate Mashouda and killing the highly successful and chivalrous commander of the Algerian raiding squadron Rais Hamidu. The Pashas of Algiers, Tunis and Tripoli all made peace and reimbursed the Americans for the financial damage that they had done. His victory ended the terror that the Barbary States had inflicted on Europeans for centuries and helped bring peace to the Mediterranean. Stephen Decatur more than any one man ended their reign of terror against Christian Europe.